Capital Segway can provide you with a full line of Segway PT parts and Segway PT accessories to help you customize your gliding experience. With everything including Segway PT cargo bags, commuter bags, headlights, taillights, Segway PT locks, GPS units, hauling kits, chrome wheels, and more, your Segway PT experience, just like your Segway PT, adapts to you. 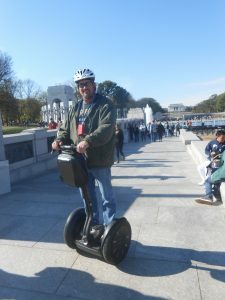 As Washington, DC’s only Segway-authorized dealer and agent, Capital Segway is the best source for everything Segway PT inside the Beltway. From the newest machines in the city, to the latest accessories, and even used Segway PT sales, Capital Segway has everything to get you moving in the most innovative way imaginable. For prices and information about our latest Segway PT accessories, and to place orders, call or email us today!